People are not always conscious of their underlying motivations. People are sometimes embarrassed to admit their real motivations, thinking that divulging them would reflect negatively on them. Most people think of themselves as being completely rational in their decision making, so they discount or dismiss non-rational reasons for their behaviors. Some people fear how marketers might use the information “if they were to learn the truth about me,” and so they withhold that information to avoid being manipulated. Projective techniques can help you better understand brand personality. For instance, consider this question: “If the brand was an animal/car/person/sports team/occupation, what animal/car/person/sports team/occupation would it be—and why?” A particularly powerful version of this question is “If this brand were a party, what kind of party would it be and why?” One can then probe on venue, music, food, drinks, people attending, what they are wearing and vehicles they drove to the party providing deep insight into brand personality. I also have used the technique of providing participants with numerous pictures of a wide variety of people in a wide variety of settings. I then ask which of those people would buy, receive as a gift, and use the brand, and which wouldn’t. I then ask people to explain their answers. To pre-order your copy of Brand Aid, click here. Some brand managers with whom I talk are still are thinking in terms of product functions and features as the brand’s primary point of difference. Don’t get me wrong, it is important to have unique or superior product features. It is also important to offer exceptional customer service. But functionality, even unique functionality, only goes so far when creating highly compelling brands. In making decisions, people are primarily driven by their emotions. This has been demonstrated repeatedly in psychology, social science and marketing studies. Emotions are usually driven by factors much more invisible than product functions and features. This is where qualitative research comes into play. Qualitative research can uncover deep emotional drivers. It can uncover self-esteem issues, paths to self-esteem, self-image, beliefs, values, attitudes, hopes, anxieties and fears. Now this is the stuff that underlies emotions. So, how does qualitative research uncover these? When we are asked to help reposition a brand so that it creates a much stronger emotional connection with its customers and potential customers, this is where we start. And when we do, the results can be quite impressive. We usually discover something that no one would have thought of without the help of the qualitative research. Sometimes, after the fact, people will say “Of course. That makes perfect sense.” But, prior to the research, no one had thought of it. To create emotionally compelling brands, start with qualitative research to gain deep customer insight. Brands are the personifications of organizations and their products and services. Selecting a brand personality is one of the tasks necessary to create that personification. Over the past fifteen years, I have helped well over one hundred brands from almost every product and service category select a brand personality. Last week, for a presentation, I counted the number of times each adjective was chosen to represent a brand for all of our past clients. When Hallmark launched the industry’s first personalized, computer-generated cards, they sent personalized cards to talk show hosts. Taco Bell quietly conducted nationwide research to find twenty-five men across America named Ronald McDonald, and featured them in television and web ads enjoying items from Taco Bell’s breakfast menu. And click here to see how TNT promotes itself with proactive publicity. Patagonia has had an environmental ethos for as long as I have been aware of the brand. (I hiked in their stand-up shorts in my college days, which are long since past.) 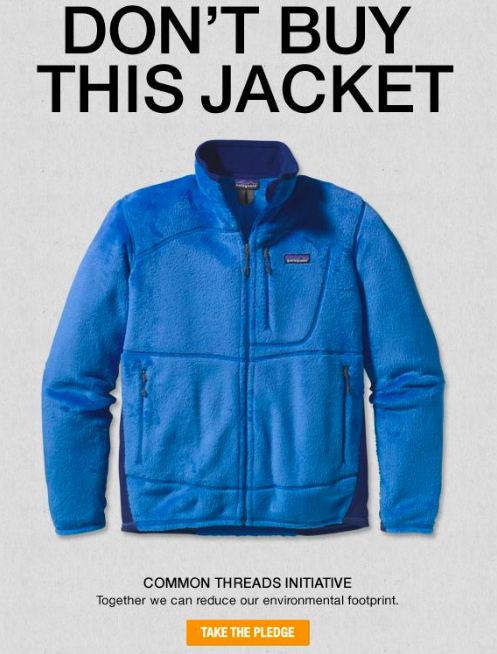 Their mantra is “reduce, repair, reuse, recycle and reimagine.” Lately, Patagonia has been urging its customers to “buy less.” Patagonia ran an ad telling people “Don’t Buy This Jacket.” They have created videos showing people how to repair used clothing and they are creating sewing kits for their customers. They also encourage people to buy used clothing and return clothing they no longer want so Patagonia can find a new use for them. Patagonia donates 1% of its revenues to environmental causes and has set up a fund to invest in start-ups focused on sustainable food, water and energy. It makes its fleece jackets out of recycled bottles, uses only organic cotton in its cotton products, was one of the first California companies to switch to wind energy and powers its headquarters with solar panels. In 2012, the first year of its “buy less” marketing campaign, sales increased almost one-third over the previous year as they opened 14 new stores. 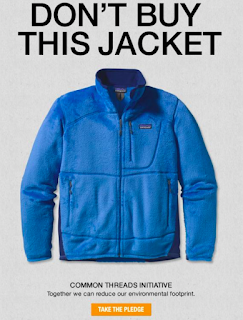 Patagonia’s customers buy into and enthusiastically support its authentic environmental ethic. (c) 2014 by Brad VanAuken, excerpted from Brand Aid, second edition, available here now. Dale Buss, “Patagonia Enjoys Unique Benefits of Its Authentic Sustainability Ethos,” August 29, 2013. http://www.brandchannel.com/home/post/2013/08/29/Patagonia-Sustainable-Ethos-082913.aspx. Kyle Stock, “Patagonia’s ‘Buy Less’ Plea Spurs More Buying,” BloombergBusinessWeek, August 28, 2013. http://www.businessweek.com/articles/2013-08-28/patagonias-buy-less-plea-spurs-more-buying. A person’s preconceived notion or expectation can alter his subsequent experience. Recall the Pepsi vs. Coca-Cola challenge in which more people preferred Pepsi in a blind taste test but more people preferred Coca-Cola in the taste test when the brand was identified. Subsequent to the original taste test, a group of neuroscientists conducted their own blind and non-blind taste tests of Coca-Cola and Pepsi. What did they find? They found that when the name of the brand was revealed a different part of the brain was activated causing a variation in the results. Also, consider how Conservative Republicans interpret the same behavior or event differently than Liberal Democrats do. Both examples are the result of preconceived notions or expectations. In his book, Predictably Irrational, Dan Ariely cites numerous examples of this biased view of the world that is difficult for anyone to escape. The lesson for marketers is that by linking the brand to positive associations prior to the actual brand experience, it will enhance the experience itself. Robert Graham embroiders “Knowledge Wisdom Truth” into every article of its clothing so that people who are familiar with the brand will subconsciously link these noble qualities to their product purchase and usage experiences, enhancing them significantly. Excerpted from Brand Aid, second edition, to be published in December. Source: Dan Ariely, Predictably Irrational (New York: HarperCollins, 2008), pp. 155-172. Why do people purchase the products, services and brands that they do? At a minimum, marketers should think about this periodically. Ideally, marketers should always be thinking about this. So, why do people purchase specific things? They solve problems. They make my life easier or safer or more pleasant. They are whimsical. They make me smile or laugh. They make me feel playful. They entertain me. They are beautiful. They are a source of awe or wonder. They calm me. They make me feel good about my life. I love to be surrounded by beauty. They surprise me. I love their unexpected nature. They fulfill my need for mental stimulation and variety. They make me feel important. They give me status. They feed my ego. They are addictive. They fulfill a deep craving. They are pleasurable. They are satisfying. They provide me with information or knowledge or access. They give me more time. They increase my freedom. They reduce my workload. They release me from mundane tasks. They reduce my anxiety. They increase my peace of mind. They give me one less thing to worry about. They stimulate my senses. They look, smell, taste, sound or feel good. Think about this. What are some other reasons people buy things? Why do you buy what you buy? What was the most recent product, service or brand that you purchased? Why did you purchase it? Why did you choose it over the competitive alternatives? What was your most memorable purchase? What made it memorable? What product, service or brand do you value the most? Why do you value it? This sort of thinking should be second nature to marketers. After all, isn’t marketing the art and science of motivating people to buy specific products, services and brands?